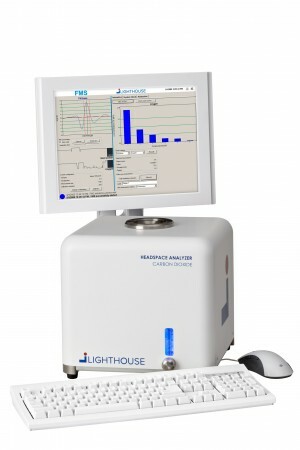 The FMS-Carbon Dioxide Headspace Analyzer is a non-destructive gas analyzer for monitoring headspace carbon dioxide concentration in sealed parenteral containers. This compact benchtop instrument utilizes a patented laser absorption technique developed with funding from the Food and Drug Administration. The FMS-Carbon Dioxide analyzer measures the absorption of laser light by carbon dioxide in the container headspace. A mean CO2 pressure, standard deviation, maximum reading and minimum reading are recorded and displayed for a full understanding the process. The non-destructive measurement enables multiple measurements on the same container over time. Because carbon dioxide is a by product of microbial growth, the FMS-Carbon dioxide analyzer can be used to monitor microbial growth in sealed containers. In addition the system can be used for 100% analysis of a batch, providing insight into process variability and allowing for optimization.